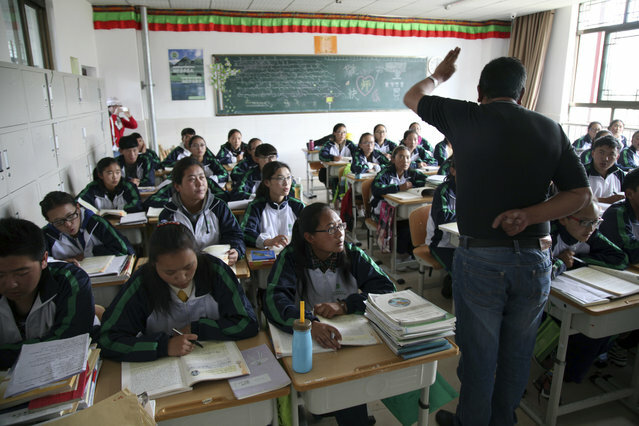 Chinese government will send 10,000 mainland teachers to Tibet and Xinjiang to improve Chinese education. (TibetanReview.net, Jul24, 2017) – China said Jul 21 that it will implement from this year a project to send 10,000 outstanding Chinese teachers to Tibet and Xinjiang to support teaching and train local teachers. The project is apparently meant to make effective China’s so-called bilingual education system which in the case of Tibet involves teaching all the subjects in Chinese language with Tibetan being taught only as a language subject. The project is a collaboration among China’s Ministry of Education, Ministry of Finance, and Ministry of Human Resources and Social Security, reported China’s online Tibet news service eng.tibet.cn Jul 21. The report said these ministries will jointly implement the 10,000-Teacher Supporting Education Programme. It was not clear whether 10,000 Chinese teachers will be sent to Tibet and Xinjiang annually or whether this will be the total number in any given year. It only said that this year a total of 5,500 supporting teachers will be sent to Tibet and Xinjiang, including both teachers and volunteering teaching students. The report said the programme will also allow inland schools share top quality teaching resources and mechanisms with schools in Tibet (Autonomous Region) and Xinjiang, helping to improve educational development in these two provinces. China’s move to shift from Tibetan to Chinese the teaching of all the subjects has been widely criticized as being designed to destroy Tibetan identity and provoked large scale student protests in Tibetan populated areas in recent years. China already sends thousands of top scoring students from Tibet to schools in China from where they graduate to pursue further study.